Card game is a common name of all games which main tool is cards. First card games appeared in China in the 9th century during the reign of Tang Dynasty. In two centuries card game became popular throughout all Asia. At the end of the 14th century card games appeared in Europe. The suits of the cards which are used now were generated in France in 1480. There are 4 suits of the cards – hearts, clubs, spades, and diamonds. A set of cards is called deck. All cards in deck are identical if the form and have the same back. Usually the deck of cards contain number cards, Jack, Queen, King, Ace. Now there are a lot of different card games which can be divided into four groups: trick taking games, solitaire games, collectible card games and gambling card games. Most of the gambling games with cards are based upon Blackjack and Poker. The game principle of Pontoon is the same like in other blackjack games – to have more point than dealer has, but not to overdraw 21.The main peculiarity of the Pontoon is that the dealer does not have the Hole Card. The dealer always hits on soft 17. Face Up 21 is an intense version of the blackjack game. 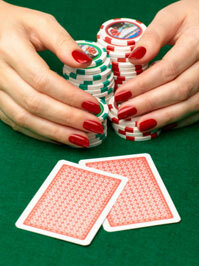 Player’s aim is to get higher-valued hand than dealer has, but no to exceed 21 points. But he may see both dealer’s cards that is why it is easier for him to understand what he needs for win. The game may seem more player-oriented, though one must pay attention at the payouts of the hands. Match Play 21 is very specific blackjack game variation. It has very attractive payouts for different combination of cards which sum in 21 (e.g. 7-7-7, 6-7-8, five-card 21). But the most distinguished thing is that the deck lacks all 10-valued cards. Want to try all variations of Blackjack? How about playing them all at a fantastic gaming destination - Mona Casino. Super 21 is famous for the bonuses it offers if the player get 21 points. These bonuses occur when the player has 21 with 5 or 6 cards. Surrender is allowed during all the game. The dealer hits on soft 17. If both dealer and player have 21 points – the player wins. Perfect Pairs offer to receive bonuses if your first two cads are identical (Perfect Pair), if you first two cards match in value and in color (Colored pair) and if your first two cards differ in color, but match in value. The major difference between the Caribbean Draw Poker and other Poker game lies into the rule that the player plays against the dealer and not other players. The Progressive jackpot is available (if the player has a Flush, a Full House, 4 of a Kind, a Straight or Royal Flush). Pai Gow Poker is played with 6 players and a dealer using 52-card deck and a joker. The aim of this game is to win both high and low hands playing against the dealer. There are a lot of different way of hand setting. In Vegas Three Card Rummy the main goal is to have fewer point value than dealer has. In order to qualify the dealer should had 20 points or less. Ante bonus is not available. The game is played with a 52-card deck. Caribbean Stud Poker is played against the house, not other players. The players keep 5 cards. The lowest hand to qualify for dealer is Ace, King, 2, 3, 4. All the rules are similar to five-card stud poker. In Let’Em Ride game player makes three bets which are equal in size. After checking three faced up cards player may take one of his bets, the second bet may be tool over when dealer turns over one of two faced down cards. The payout starts when the second faced down card is turned over. In Texas Hold'em Bonus Poker player makes an additional side bet to the initial bet. This bonus bet is paid off if player has one of the following pairs of cards: Ace&King, Ace&Queen, Ace&Jack. The size of the bet depends upon the starting hand of the player. The aim of Baccarat is to get the higher total value of cards than dealer has and to be as close to 9 points as possible. If your card value is more than 9, you should count the sum of the components of number (e.g. 5+6=11 than 1+1=2). For Ace you get 1 point, for 10, J, Q, K – 0 point, for 2-9 – according to their number. Whether you are going to Vegas or you want to play online casino, you needn't worry, as both online and land casinos usually offer a great variety of different card games. Before you start to play learn the rules and terms of the chosen game. Do not forget that rules may differ according to casino’s policy. Check strategies which correspond to the rules of game and you will be successful in your gambling activity.